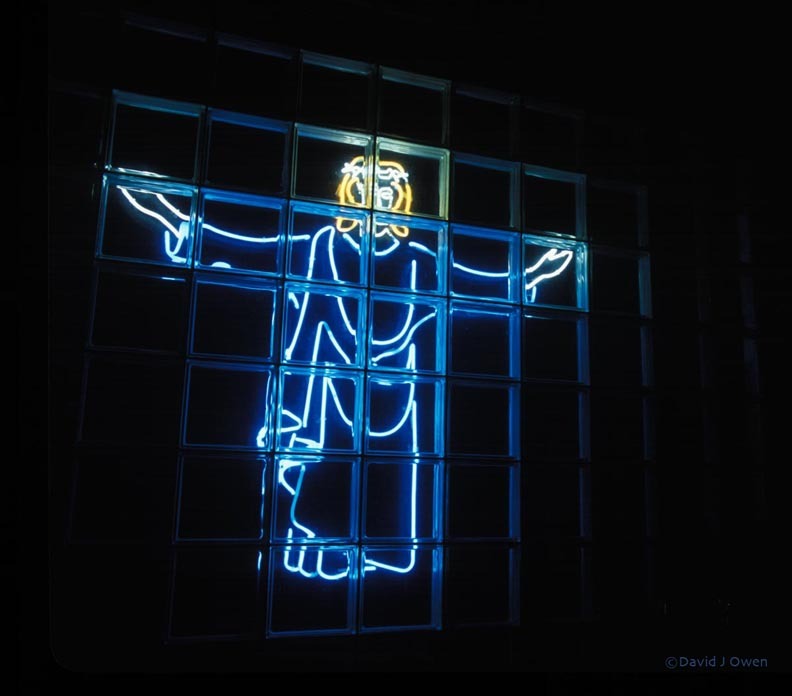 A recent survey by the Pew Research Center finds that the more people go to church, the more likely they are to support torture. And you’re never going to guess which group is most supportive of torture. Oh, did you guess white evangelical protestants? Then I suppose I underestimated you. Please don’t waterboard me. There are two obvious explanations for why 60 percent of white evangelical protestants are such torture-lovers. The first is that they are so fixated on the afterlife that they are more ready to forgive crimes against the corporeal body. The second is that they are by and large sanctimonious fucks. Either explanation works for me. Though having grown up in an extended family filled with white protestant evangelicals, I probably have more sympathy for them than most. I think maybe they have just evolved a different understanding of what constitutes torture. Have you ever been to a wedding reception where the guests think drinking and dancing are sinful activities? It’s like Chinese water torture with mayonnaise and awkward handshakes. Have you ever thought that kosher salt, despite possessing a near-perfect balance of size, shape, and texture, was just too jewy or something? If so, you’re an idiot. And congratulations, idiot, now you have options! He said coarse-grained kosher salt is named for the way in which it was traditionally used – to draw blood from freshly butchered meat, because Jewish law prohibits consuming blood. Chefs often favor kosher salt because it’s crunchy and easy to pinch. See, it’s not that Godlewski is explicitly anti-Jewish. He’s just pro-Christian. Frankly I don’t see anything wrong with his approach. If the salt takes off, Godlewski plans an entire line of Christian-branded foods, including rye bread, bagels and pickles. I wonder if the rye bread is baked over a burning cross. “As a Catholic university, we view the crucifix as a sacred symbol and its placement reflects our commitment to our religious heritage. We hope that those who do not share our faith tradition can respect our intentions,” he said. I say they are all wasting valuable time. 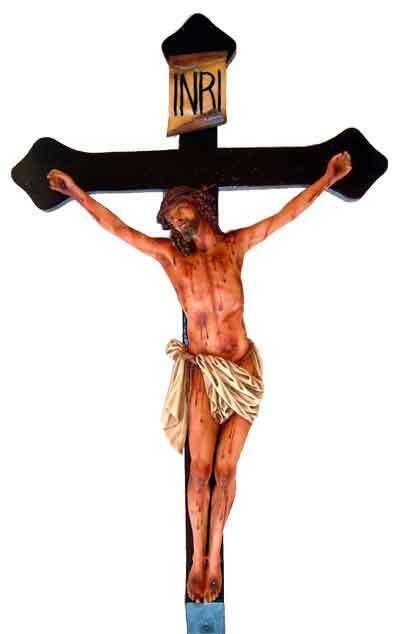 Crucifixes are well-known for their ability to turn back vampires — which is an admirable quality but not one we’re likely to need anytime soon. 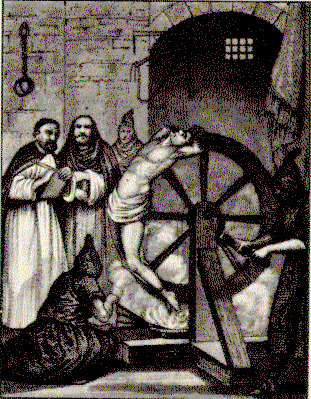 Some devout Catholics believe the crucifix even thwart attacks from demons and succubi. But not once in the entire 2009-year history of the crucifix has it ever proven effective in the ongoing war on zombies. In fact, in almost every single zombie attack ever caught on film, a priest is shown meekly waving a crucifix at the shuffling mass of undead as it subsumes him. This is science, people. Pay attention. Unfortunately Boston College doesn’t see it this way. 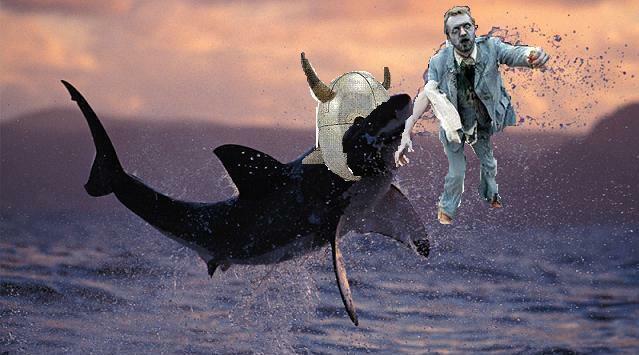 The administration has failed to reply to multiple pleas to install head-splitting battle axes in each classroom and to stock the natatorium with flying shark vikings. I suppose it’s only a matter of time before Chestnut Hill is overrun. Look, I’m not saying he should be removed from office or anything, but the bearded one has been doing the same job for at least 4,000 years. People get bored, you know? One day you’re firing on all cylinders and taking on all comers. The next day you’re hitting the snooze alarm three times and spending two hours at Costco just to get away from the office. Most of us just miss a few meetings or lose a few clients when this happens. For the big fellow, the stakes are higher. I’m guessing He misread His own handwriting. The Christmas tradition in North America is a month-long carnival of love and giving, with dozens of smaller traditions (the indoor tree, the mistletoe, the fat guy in the suit) built around those central components. Sure, we murder wassails by the thousands — and occasionally we trample minimum wage workers — but for the most part our Christmas traditions are as peaceful as they come. They do things a little differently in Bavaria Austria. Apparently, Bavarians Austrians like to combine Christmas and Halloween into one giant scary festival of gruesome masks, presents, heart attacks, family, and spanking. That’s right, I said spanking. 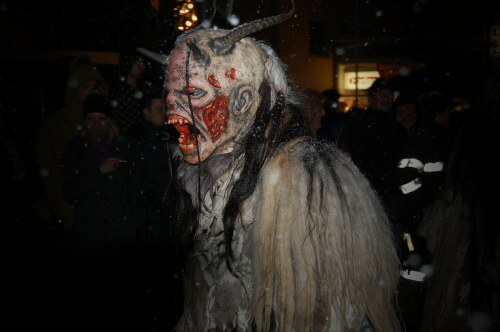 The major thrust of the Krampus tradition is that young men dress up like the charming fellow above and roam around public markets scaring the piss out of local children. Apparently the ghoulish figures are supposed to be the alter egos of St. Nick roaming the streets and yelling to scare away St. Nick. And they like to spank women. After the jump, more photos of the fun. For a complete slide show, check out this site. Probably the most disturbing Bible story — at least to high-minded epicureans food snobs like Pax Arcana — is that of the transubstantiation. According to mainstream Christian dogma, Jesus turned the wine and bread served at the last supper into his blood and body. (And lo did his disciples say unto him “Aw, gurrrg, awww… what the F Jesus?” as they did spit bits of soft tissue and coagulated hemoglobin upon the ground). But what about the other stuff? 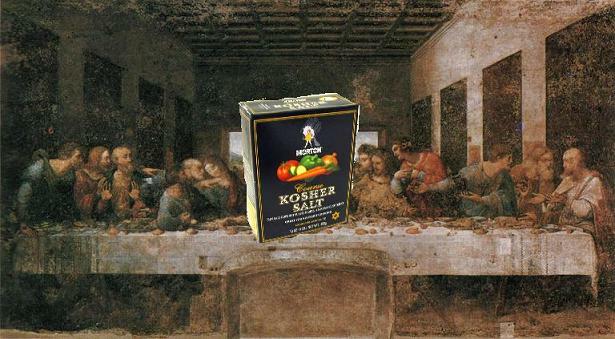 In Leonardo DaVinci’s masterpiece The Last Supper, bread and wine are not the only victuals on the table. There are plates of heretofore unidentified dishes scattered about the table-top. The rapid decay of the painting — writings from as far back as 1517 had already noted that it “had begun to spoil” — rendered many of the finer details of the work, including the actual type of food on the table, impossible to discern. According to an article in Gastronomica (via Boing Boing), the mystery has now been solved. 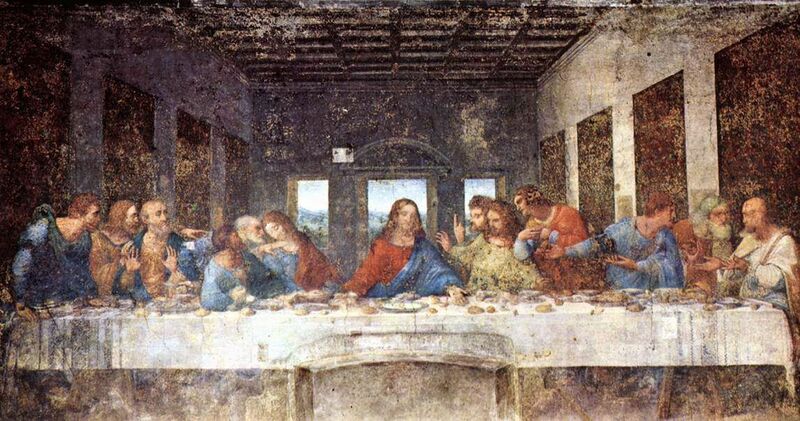 The 1997 restoration of The Last Supper has revealed that Jesus — at least in DaVinci’s imagination — spent his final evening pounding not only bread and wine, but also grilled eels. The eels in the Last Supper may or may not have been on Leonardo’s diet, but they certainly enhance the realism of the representation. Eels were especially popular in Renaissance Italy because they could survive out of water for days and be easily transported in grass-filled baskets or, once dead, be preserved in brine.15 According to Bartolomeo Scappi, the best ones came from Comacchio, near Ferrara. G.B. Rossetti, another sixteenth-century author, gives thirty different recipes for preparing them. What is most remarkable about all of this is how it confirms my belief that I am an artistic visionary on par with DaVinci. In my own artistic interpretation of the life and meaning of Jesus, I also intimated that he ate eels before his crucifixtion. OK, so they were electric eels. What are you, some kind of art critic now? Good morning, brothers and sisters. I trust you arrived at your workplaces comfortable in the knowledge that there is a God above who loves you (unless you’re a Phillies fan, naturally). What’s that? You’re not sure about this God business? Seems a little silly to align your entire belief structure around a supernatural being first conceived of by desert nomads 2,000 years ago?